Inside: This list of the top 12 baby supplies for infant care for baby’s first year. 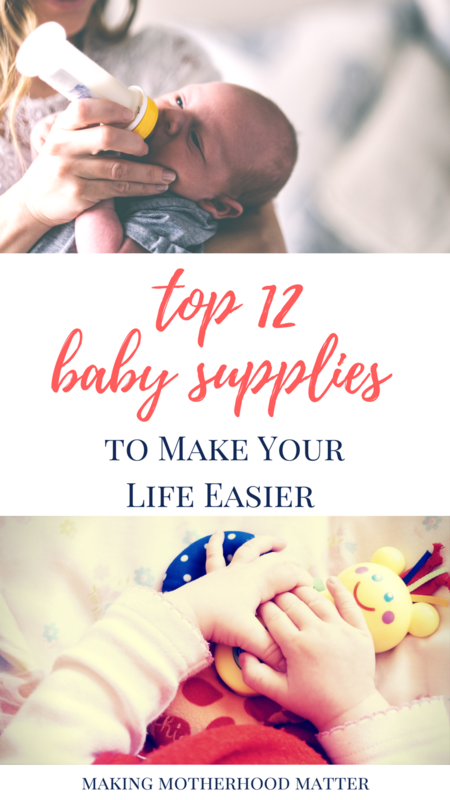 This product list includes the must-have organization supplies to stockpile for a newborn. Motherhood, together with the infinite happiness, brings with it lots of new, sometimes hard chores and tasks as well as a great responsibility for the safety and health of that little human being of yours. However, the life of mothers has become much easier in our era of innovative technologies which, developing at the fastest pace ever provide us with a variety of new tools, products, gadgets that come with different functionalities aimed at saving your time and energy. After careful research, we decided to gather all those top baby supplies that will make every mother’s life much easier and more comfortable in one place. 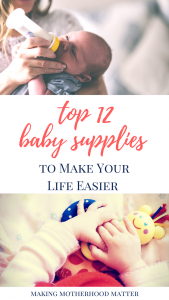 Keep reading to find out the most needed products for saving time and for making the most out of their babies’ childhood. Taking into consideration all the minute details connected with motherhood and with the appearance of a baby in a woman’s life, the changes that it brings, we have made a list of top baby care tools that will make it easier for you to decide what’s most important to have on hand when your baby arrives. Following our baby care tips, you’ll be completely ready for the arrival of your child. Bath cushions: In order to make the most out of your baby’s bathing experience we recommend you to buy a bathing cushion. They come in different, pretty designs and are incredibly soft and comfy. Your child will enjoy the bath in these cushions. Electric nail trimmer: It’s no news that trimming a baby’s nails can be a lot of trouble. But here is another achievement of the innovative technology – an electric battery operated nail trimmer – it will gently trim your baby’s nails without harming the skin around them. 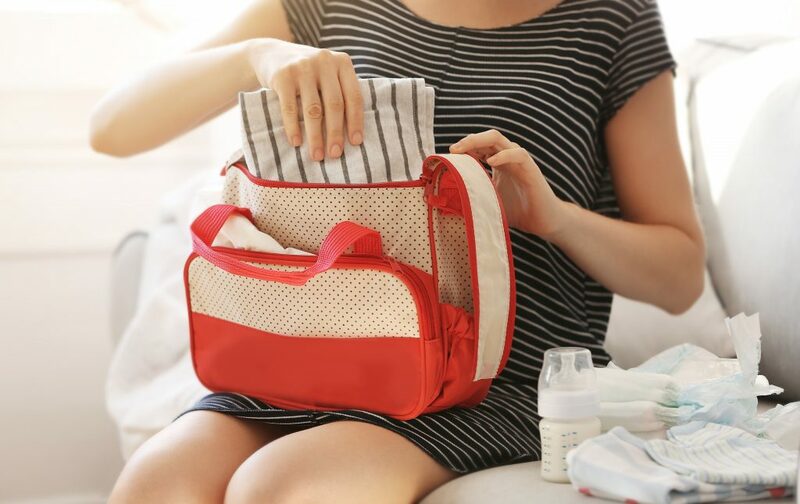 Diaper Caddy Organizer: Keeping the baby’s supplies like diapers, wipes, cream, lotions, clippers, etcetera is way easier with an organizer. I was gifted the diaper caddy in the link and I love it because even in the middle of the night, I know exactly where everything is. Cotton balls: If your baby has just arrived in the world then the best way to clean his little eyes and skin is by means of sterile cotton balls. Simply, dip them in water and they are ready to carry out the cleaning task. Baby carrier backpacks: Going on long walks or hikes with a baby or a toddler might be too tiring especially if you have to carry your child most of the time. Here is when the popular baby carrier backpacks come to the fore to help you. With these backpacks, you’ll be able to carry your child without having to hold him with your hands constantly and at the same time, you can rest assured about his safety. Baby carrier backpacks are comfortable not only for long walks but also for fulfilling your routine tasks such as going on a shopping. There are two main types of backpack carriers: framed and unframed. The former is comparatively more expensive but are worth the purchase. They are sturdy and make up a comfy, balanced position for your baby. The latter is much cheaper and lighter as they lack this support frame. Because of this, your baby will sit lower in them making you feel like carrying a much heavier weight. Nasal aspirator: This is what you need in order to keep your little one’s nasal cavity clean. The aspirator is operated by means of a tube that is to be held in your mouth, the best means of first aid especially when your baby has caught a cold. Baby care timer: Having to carry out thousands of chores around the house you might get too busy and miss the time when you have to feed your baby or change his diaper. The baby care timer will remind you of these tasks right on time. Breastfeeding station: This might include a comfy rocking chair for you to sit on while breastfeeding or a soft pillow for your baby’s comfort or something related to these. Lots of moms have noted in a number of reviews that they can’t do without a breastfeeding station and that the latter makes the process much easier. Skincare products: Before starting to use any kind of a skin care product on your baby it’s a must to consult your pediatrician. After getting the necessary advice from the doctor you can already use creams, baby shampoo, baby bath soap or liquid to keep your child’s skin clean, tender and healthy. Digital thermometer: Don’t forget to have a digital thermometer bought specifically for your child at hand. Sunscreen: Protect your kid’s skin from the sun rays with the help of baby sunscreen. Bandages and adhesive tape: And last but not least, always remember to have these first aid items with you no matter where you are. You should always be prepared for different situations with your little treasure. Now, you can decide which one of these items your house lacks. Following our baby care tips will create the highest level of safety and comfort for you and your baby. Make the best of your motherhood and your baby’s childhood by saving your time and energy! P.S. If you enjoyed this piece, you may also like Easy Two-Minute DIY Diaper Caddy With Simple Organization Hacks.